Advantages: Detailed and corrected scale plans, excellent artwork, “new” photographs, informative stencil data information, enlightening captions. The Fokker Dr.I is a firm favourite with many World War I aircraft modellers and the latest “Datafile Special” is sure to prove popular. 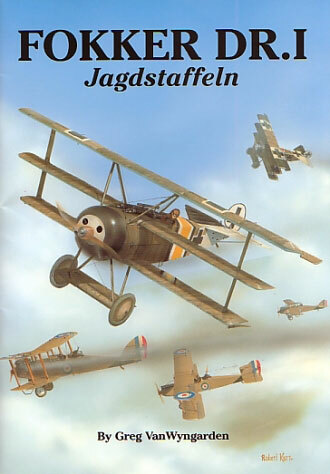 With 84 pages to its credit, this A4 sized publication covers the markings of 18 Jastas that operated the triplane. Not forgotten are the pre production aircraft that are always inciting heated discussion with regard to their finishes. The author doesn’t bite into this latter argument and instead presents the available information in an orderly fashion and allows the reader to come to their own conclusions. Sensibly the Jastas are examined in numerical order which permits quick and easy reference to the Units concerned. Each is represented with photographic coverage of the aircraft in question, with the lion’s share being devoted to the more “successful” Jagdstaffeln. Obviously the availability of the images also contributes to this. There are over 250 photographs in total with the more interesting ones being printed two or three to a page. Considering the quality of the original images, the reproduction is very good. Unavoidably, seasoned enthusiasts will be familiar with much of the above, but there are still many “new” gems that will take even these readers by surprise. The captions are a valuable text in themselves with each telling a story about the subject being presented. It’s evident that the author has called upon a number of sources to make these descriptions as accurate as possible. This publication also updates the previous books from Albatros Productions on the Tripe. Thanks to a new set of detailed 1:32nd scale plans from Marty Digmayer, the misdemeanours of past versions have now been corrected. For example, gone are the “hinges” on the axle wing, which now show the correct bungee cord access covers. Other included items, missed by Ian Stair’s otherwise superb drawings, are the oil filler cap, gun muzzle blast plates and the correct placement of the upper wing celluloid window. The relocation of the latter item has gone unnoticed by some of this book’s artists as their profiles still show this in the old location! Speaking of the artwork, this is up to the usual high standard expected from these regular contributors. Ronny Bar, Robert Karr, Juanita Franzi and Bob Pearson all display their considerable talents, and as a result, over 10 pages of artwork are featured. A colour centre spread displays all the “official” décor that identified each Jasta and the featured stencil guide has to be one of the most comprehensive yet. Not a page is wasted in this lavish publication. By virtue of the corrected data, it easily supersedes previous books from this publisher. Additional information that has been unselfishly offered by other aficionados has helped this come about. As a result, gone are references to Jasta 32b, weight tables are accurately portrayed and a more thorough understanding is available on the myriad of colour schemes. Triplane enthusiasts have waited a long time for an update and this is it.